Paul Glimcher co-created the field of neuroeconomics a decade ago. After a first book in 2003 which imagined a research program for neuroeconomics, his just published second book delivers the first results. Is neuroeconomics now a reality? What questions does it raise? 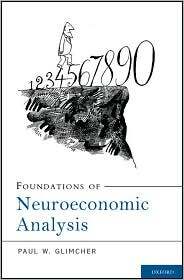 I review the book here: http://seinecle.110mb.com/html/neuroeconomics.php (first item of the list). PS: In the review, I did not comment on the book’s dust jacket. As can be seen above, it conveys a very gloomy impression of the topic of neuroeconomics – for a book which actually promotes it! I would be curious to know how this very wrong choice of an illustration came to be made.